Just Us | Where in the World Are Our Kids? “Does anyone have a cheap car they are willing to sell asap?” one of our Facebook friends posted. Our ’99 Chevy Tracker was a birthday gift from me to Ken over a decade ago. While remarkably rugged, it had seen better days. It had been rear-ended twice and not quite repaired by the Chevy dealership. The dome light blinks uncontrollably. It has a strange vibration over 45 mph. The inside door handle on the driver’s side is missing. One window doesn’t roll down. The air conditioning is anemic. But we loved that vehicle. Its four-wheel drive had taken us to Canada and back several times, including through snow and ice storms. Though small, it had hauled washing machines, dishwasher, chairs, college students, new puppies, and all manner of junk. It moved down from Indiana with us. It carried me on rotations. It took us on vacations for years. But still, its reliability was doubtful, and we were hesitant to pour money into it. Now with kids coming in the future, we needed to rethink our transportation options. Our beloved Tracker’s days were numbered. But who would buy a glitchy ’99 Chevy Tracker? We thought we would do as we had done before, donating the car to charity and taking the tax deduction. When I saw our friend’s post online, I remarked in jest that I had a car for cheap. When he asked for specs, I thought he was kidding. When his wife texted me the next day, I figured I should respond. So I was honest about all of the things that my brain could think of. He asked if he could come look at it and how much we wanted for it. I figured we wanted to get the value of the tax benefit out of it, and I invited him to look at it when Ken was at home. I never thought that once he laid eyes on the vehicle would he actually want it. Oh, right. This was KEN’S car! I mentioned it to Ken in passing that someone wanted to look at buying the Tracker, and he flashed the same incredulous smile that I had when I saw the Facebook post. The next day, our friend came by, and asked if he could take the car for a drive, and Ken said, “Sure. Here are the keys. We know where you live.” After a few minutes he returned and told Ken that he would be back the next day with the money. Perhaps I hadn’t gone into enough details with Ken. Fortunately, Ken was agreeable and the deal was made. Turns out, our friend is extremely handy, and he can fix cars. Nothing that was wrong with the Tracker was anything that concerned him. The glitches could be fixed in his skillful hands. He was coming to get the Tracker the next day. I had sort of accidentally sold my husband’s car. And I had to go to a conference the next day. And Ken had to go to work. Uh, oh. We needed a car. I apologized profusely for selling Ken’s car, for which he graciously forgave me. Fortunately, I had done a lot of research about what kind of vehicle would meet our needs and our budget, and we got a fantastic deal at CarMax the very next morning. The money from the Tracker allowed us to put down a down payment on a vehicle. 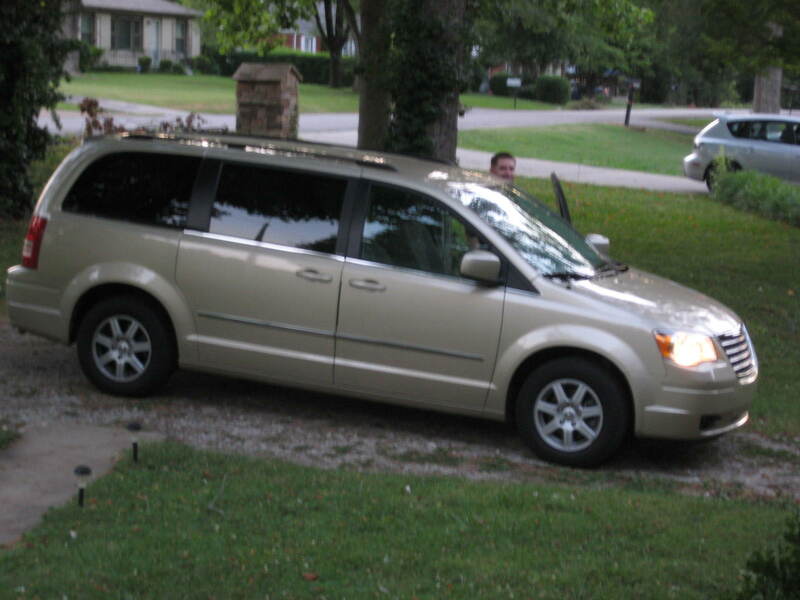 While we had never pictured ourselves as minivan owners, we wanted the ability to haul kids, dogs, equipment, etc. but an SUV was just out of our price range. So when the deal was signed, the car was inspected, and they handed the keys over, it was quite awkward when neither of us wanted them. We giggled as we argued back and forth as to who HAD to drive the minivan. So here is the vehicle I now drive. All because I accidentally sold my husband’s car. I [Ken] am not a fan of shopping in any form or fashion, but I must admit I have enjoyed the last couple of Saturdays as Robin and I have been “yard-sellin”. True, we’ve gotten some GREAT deals on children’s clothes and toys, but that’s not my favorite part. I am excited about the children who will be wear those clothes and playing with those toys, but that’s still not it. No, my favorite part has been the encouragement that Robin and I have received from the people selling their wares. A typical encounter begins with us looking over what the folks have set out. We invariably gravitate to the children’s clothes. “How big are your kids?” Is the question that is almost always asked. “We’re not sure.” Is our usual response. Odd looks. Afterall, what kind of parents don’t know their kids sizes? Robin and I exchange looks. We mentally play rock-paper-scissors to determine who’s turn it is to explain our situation. People want to see pictures. They want to hear details. They feel free to ask questions. Lots of questions. How old? How long? What language? When are you going? Why the Congo? Other customers wait. Or ask their own questions. But always. ALWAYS. People wish us well or promise to pray for us. They seem to be genuinely excited for us. Every yard sale quickly turns into pep-rally. Strangers give us hugs. STRANGERS! HUGS!!! Seriously! Better than the deals is the fresh excitement and enthusiasm. God has been blessing us through the kindness of strangers. [*] Actually most people give us CRAZY deals. Sometimes I don’t want to tell people because I don’t want to be guilty of manipulating their emotions. But Emmanuel getting school approved polo shirts for only ten cents is AWESOME! Tonight’s Christmas adventure-seeking took us to Murfreesboro to the coffee roaster that helps us raise funds for adoption: Just Love Coffee. Tonight they had an event called Carols and Coffee, which was a fundraiser put on by another church to raise adoption funds for an adoptive family. Because we’re an adopting family, we were able to direct the money we spent toward our adoption, and enjoy some great coffee and awesome music. The coffee shop is nearly impossible to find without a Garmin and a good amount of faith that it’s correct, but we loved the shop. Lined with 1980’s classic video games, it was like we had stepped back to 1985, when Donkey Kong, Robotron, and Karate Champ were quarter-sucking entertainment magnets. There were many seating options from the counter, to table-top video games, to traditional couches and tables. There was a wooden loft with extra seating and many video game options as well. But the best part of Just Love Coffee was the coffee itself. I enjoyed a pumpkin spice caramel latte, and Ken had a caramel mocha. Having been a barista myself, I must admit that I’m a bit of a coffee snob, and of course it must be fair trade. My cup of coffee was perhaps the best cup of coffee I’ve ever had. Perfection. We also each had a dessert, a red velvet roll and a pumpkin roll. Also excellent. We stayed to enjoy the music for a while, but soon realized that there were so many people standing, we gave up our seats, bought the Christmas CD and headed back to Nashville. If you’re ever in the Murfreesboro area, and craving a cup of coffee, make the effort to find Just Love Coffee at 129 MTCS Drive. You will love the coffee, and the atmosphere, and you’ll know that you’re supporting farmers around the world, and supporting adoption. If you mention our names, we’ll even get a portion of the profits! And if you’re not near Murfreesboro, check out Just Love Coffee products online at our coffee shop! Coffee. Dessert. Christmas carols. Supporting a good cause. I must confess, I have not put up our Christmas tree this year. Exhausted seems to be the theme for this year, and I just didn’t have the energy over Thanksgiving break when I usually put it up, and we’ve had plans almost every night since. Then I thought my semester would end last Friday, but alas, I continue to have to plow through must-do lists before Christmas break. Add on top of that a case of bronchitis, followed by a head cold, which of course makes my asthma crazy. No. I haven’t put up my Christmas tree yet. So when I pulled into our driveway this afternoon, I was shocked to see twinkling lights coming from our living room window. This evening, we toured some of the best residential Christmas light displays in Nashville, including the official Metro Nashville’s Best Christmas light display. We drove from Donelson, to north Nashville, to Hermitage, to Antioch, to Brentwood, and finally to Franklin, to drop off our Christmas letters to Santa. (Apparently the Franklin Parks and Recreation department has special connections.) We listened to Christmas music, and had a great time just spending the evening together. For today’s Christmas activity, we had the opportunity to view Christmas through the eyes of over 100 artists’ nativity scenes from around the world in the Night of the Child Exhibit at The Upper Room Museum. More than 30 cultures were represented, in media ranging from wood to porcelain, wax to paper, and everything in between. The exhibit was amazing. Each scene spoke something of the birth of Christ, and about the culture from which the artist came. From pocket-sized nativities meant for those who couldn’t make it to Cathedral at Christmas in Hispanic cultures to an exquisite oragami nativity, each was a wonder to behold. In addition to sculptures, there was also a lovely collection of paintings of Mary with Jesus as a baby. Many were rich with symbolism and expression reflecting the paradox of a mother raising God Incarnate. My favorite nativity was an elaborate one, taking up a whole corner of the museum. The scene was a busy Bethlehem. There were merchants, and busy households, musicians, children playing, men fishing, etc. I had to look carefully for the manger scene, tucked away behind one of the houses. And indeed, up behind the city was a group of shepherds tending their sheep, but no one was paying attention to them. It was strange that the artist depicted so much going on while Jesus was lying in a stinky barn in the background. Why weren’t all of the characters facing the manger? It was as if they were so wrapped up in the busyness of the census that they never realized that their attention should have been focused only on a tiny baby just inches from them who had come to save the world. And in a quiet corner of The Upper Room Museum, I saw a reflection of us, and of me. Busy with party after party, baking, wrapping, standing in line, shopping, grading papers, worrying about two precious children who may not even know that it’s Christmastime. Meanwhile, the Savior of the World waits quietly to for us, for me, to take note. And really, every artist’s reflection echoed the same message. Quiet. Humility. Pausing to kneel. Worshipping. God With Us. Thanksgiving through Christmas is a busy time in the life of our church. From the all-church Thanksgiving dinner, to the children’s and the middle school Christmas productions, our church loves to gather around some good food and good company each Sunday evening. Tonight’s Christmas celebration is what has become fondly known as the Diva Christmas show. Traditional carols and newer tunes are sung by ladies, and they were joined by a male vocalist (divo) this year as well. It was a sweet evening of music while enjoying our potluck soup and salad dinner. The “after party” for the Diva Christmas show was the annual college ministry Christmas party. Students who have gone away to college have now returned for Christmas break, and it was awesome gathering together for awesome food, a chance to catch up, and a “regift” Dirty Santa gift exchange. Much fun was had on the sixth day of Christmas!